Compounding pharmacies are pharmacies that produce drugs tailored to the needs of individual patients by altering, combining, or mixing active pharmaceutical ingredients of drugs. Compounded drugs are prepared under prescription from physicians. Compounding includes combination of two or more drug ingredients in varied proportions. Most regulatory agencies across the world do not approve compounded medications and do not verify the safety or effectiveness of compounded drugs. These drugs are also mostly not reimbursed by pharmaceutical benefit agencies. 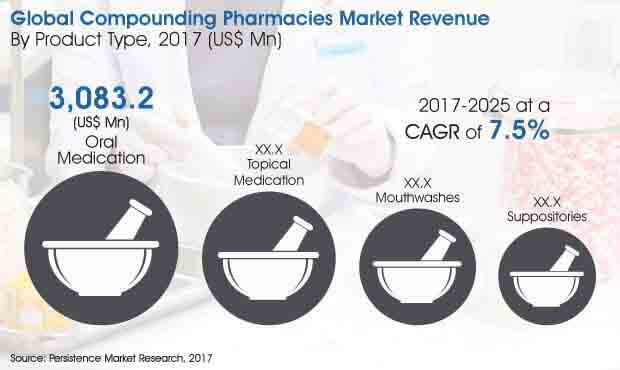 The global compounding pharmacies market is forecasted to be worth US$ 13,366.5 Mn by 2025 end and is expected to increase at a CAGR of 7.5% throughout forecast period. North America is the largest regional market accounting for 66.6% market share in 2016 and is expected to grow at a CAGR of 7.6%. The prime driver for the compounding pharmacies market is medicinal drought. When the need for critical drugs are not met through commercially available branded equivalents, compounded drugs are sought after. Furthermore, increasing demand for anti-ageing products that use custom compounded drugs is a prevalent trend across the globe. Innovative sub-therapeutic areas such as bio-identical hormone replacement therapy are also contributing to the growing popularity of compounded drugs. Ease of administering compounded drugs is especially noted in critical illnesses such as cancer, where a patient is unable to swallow a pain-reducing drug. The drug is either administered as a lollipop, transdermal application, or sterile preparation. Increasing need to conform to regulatory specifications is however becoming a necessity for compounding pharmacies all over the world. By product type, the oral medication segment is expected to gain more than 40% of the market share in terms of revenue in the global compounding pharmacies market. Topical medication is the second largest segment by product in the global compounding pharmacies market. The oral medication segment dominates the global compounding pharmacies market and is expected to be the most lucrative segment, with a market attractiveness index of 2.2. The medication for adults segment is expected to gain maximum share in terms of value over the forecast period. The hormone replacement therapy segment is expected to gain maximum share in terms of value during the forecast period. North America is the largest market in terms of value and is expected to increase at over 7.6% CAGR during the forecast period. Increasing out-of-pocket healthcare expenditure in developing economies such as India and China is expected to fuel the growth in revenue of compounding pharmacies. Asia Pacific is projected to have the highest market potential and is expected to grow at 9.2% value CAGR over the forecast period.